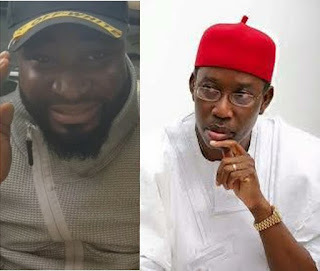 Nigerian singer and Alter Plate record label boss, Harrysong earlier today took to his Instagram page to share a new video in which he called out Delta state governor, Ifeanyi Okowa, for not taking any step on the increasing rate of communal clashes in the state, particularly the clash between the Ogbe Ijaws and Aladja people. In the new Instagram video, Harrysong who accused the state governor of not being a leader, said he is just a businessman that only want to make money for himself and his family. "I woke this morning highly infuriated and troubled about how much Nigerian politicians have raped this country without a conscience. Even my state Governor, Sen. IFEANYI OKOWA is worse. Aladja and my community, Ogbe Ijaw have been killing themselves for years and OKOWA is rather playing a businessman than a father and a leader he is meant to be. Come 2019, we need leaders, not politicians.? "> He captioned the video. Watch As Youtuber Accidentally Records His Death While Trying To Make A Video On How To Escape From Quicksand When Sinking!